If you are new to the escape room scene, this room will really impress you. It is a fun escape room! Because I’ve played so many escape rooms, I expect very specific things to truly impress me above and beyond. I want a game that has a great setup, story, decor, props, puzzles, logic, ambience…basically I should feel like I’m in a movie solving puzzles to escape a seriously awesome scenario. This room had some of those strengths but fell short in other areas. First of all the story is pretty good, but the setup is lacking. There is no video, audio or otherwise storytelling aspect aside from the owner David (who seems very nice) telling us quickly the story. The room looks good and uses mood lighting, but there is no music or sound effects. The puzzles are not particularly difficult to solve once you find everything you need. Unfortunately the ending to me was a let down because I had high expectations and it just didn’t live up to them. I feel like this room would be improved if it used effects to make it a bit more scary. Also some of the set pieces/props are already getting quite beaten up and they haven’t been open very long. Unfortunately that is to be expected of games, but a truly amazing company will be on top of those things with replacements immediately. Also part of the reason it is not a five star room in my opinion is the price we paid to play. I didn’t feel like it should be a $45 per person game compared to other rooms I’ve played in town for less. We had a two person team, it is cheaper per person the more you have on your team though. This is a fun multi-room live escape game. It is well decorated. There is more “stuff” than you need to solve the puzzles, but it adds to the feel of the room. There is both searchinog and puzzles. It’s a bit like a home haunt and an escape room had a baby. I recommend playing if you are in the Bakersfield area. The owners seem quite nice and passionate about the escape game industry. They are sisters and first time business owners. The fun creative backstory is well thought out and connected to the puzzles throughout the escape room. It isn’t linear, so there is a lot to do from searching to solving. We played as a group of two, but there is plenty to keep a large group busy. You have unlimited hints and the hint system is done in a way that allows you to continue in the same mindset of the environment and gameplay, unlike many games where the hint system is disruptive. The game takes place in one rather large room with good decor, lighting and ambience. 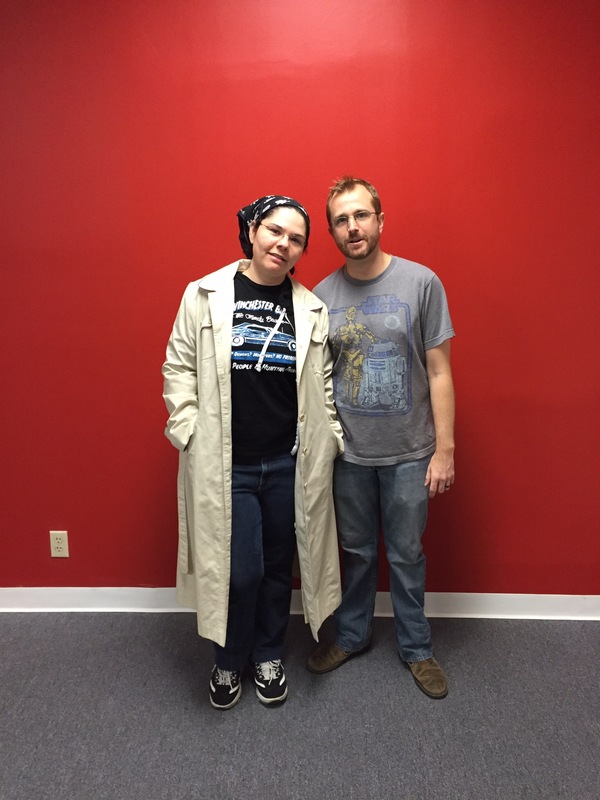 Curtus & Kathy are wonderful and passionate about escape games.